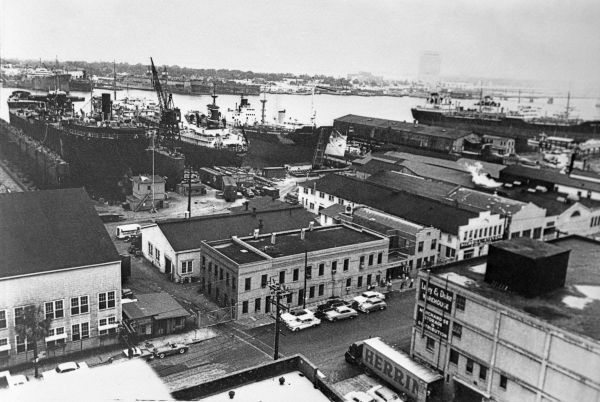 Although its not as evident as it once was, at one time, the waterfront and shipbuilding was the economic engine that drove this city. 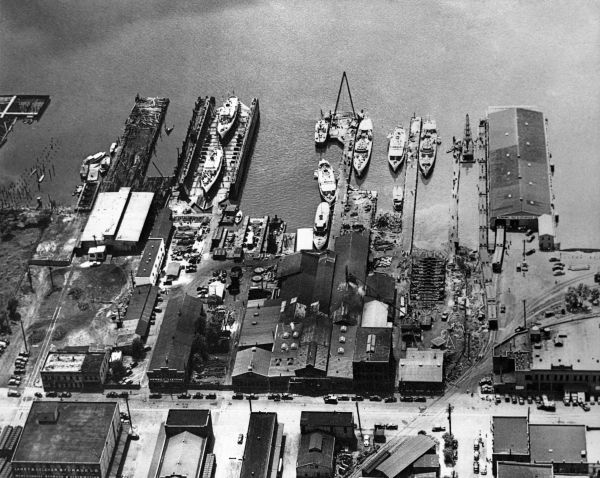 For week three, here are some historic aerials of our urban waterfront. 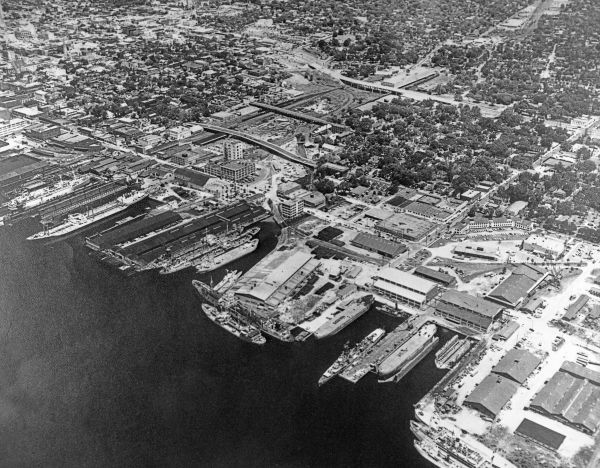 St. Johns River Shipbuilding Company in the 1950's. 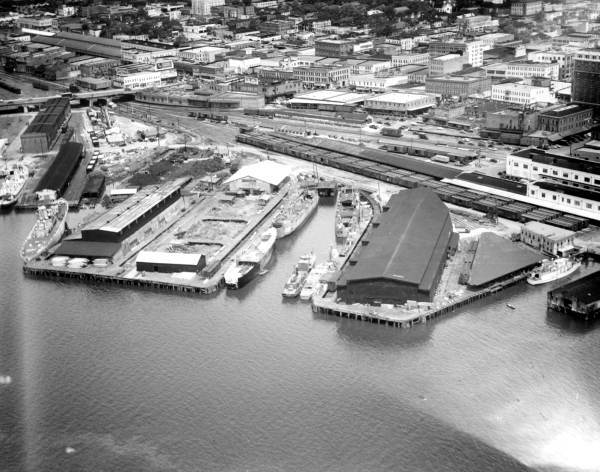 Gibbs Corporation Shipyards, in the 1950's, on the southbank. 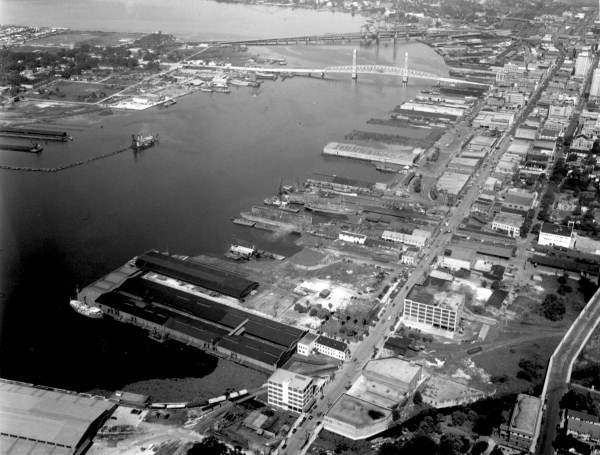 current site of Kids Campus and the Shipyards land, in the 1950s. 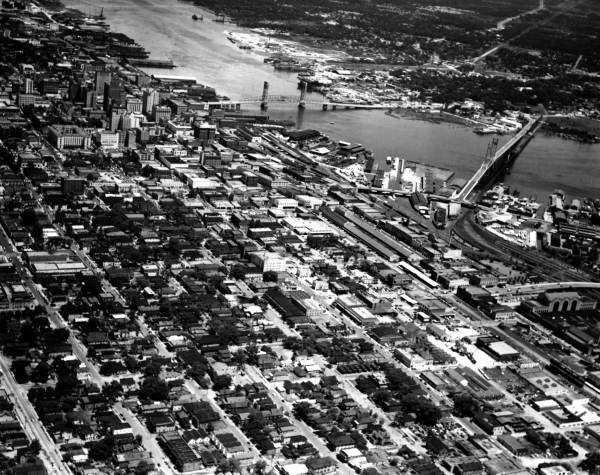 aerial view of the city and river in the mid 1940's. Density anyone? 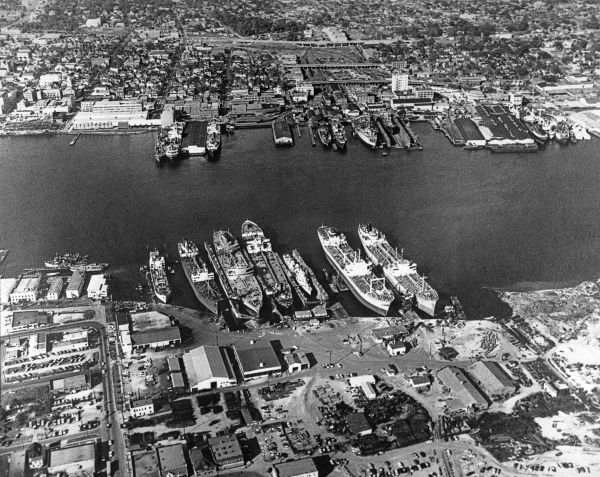 and you think we have too many parking lots today? Jacksonville's rebirth has been amazing. I have a postcard with all of the surface parking lots and it is ugly. I am thankful for what we have now instead of gimmie, gimmie, gimmie. 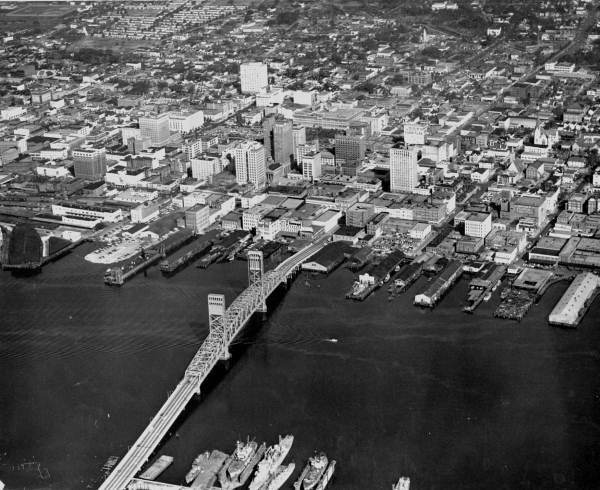 Cities can always improve and jacksonville's upswing is awesome. Look at the picture above that has the Main St. and old Acosta. 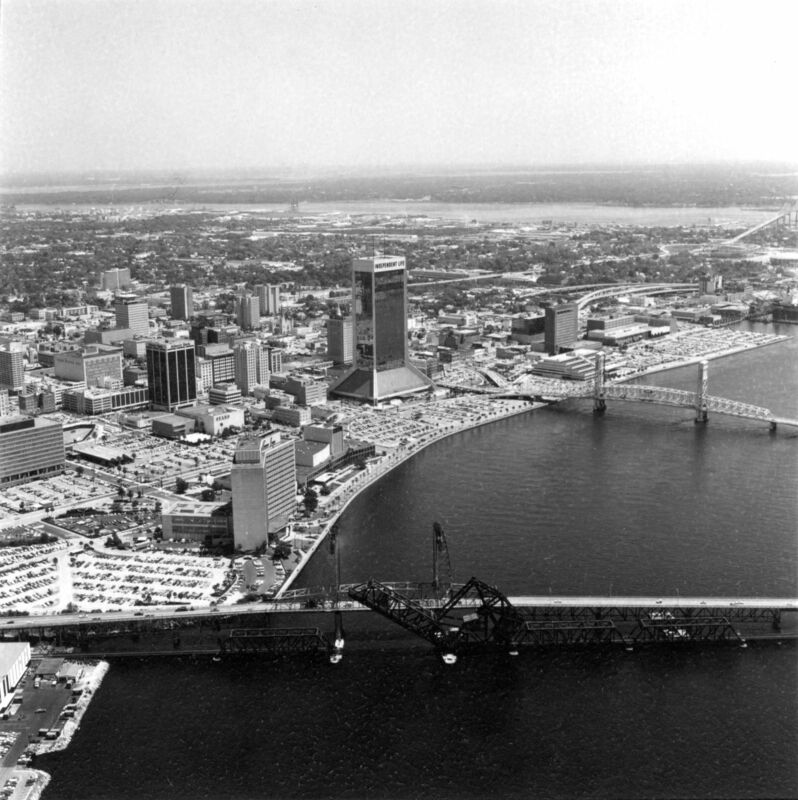 Notice how The Acosta Bridge ends on the northbank. Urban Design Question #1: Which is more pedestrian friendly, the one above or the Spaghetti-Style, Atlanta-Inspired Mess we have now? True, there's no doubt the bridge we have now has effectively cut off Brooklyn from the downtown core. 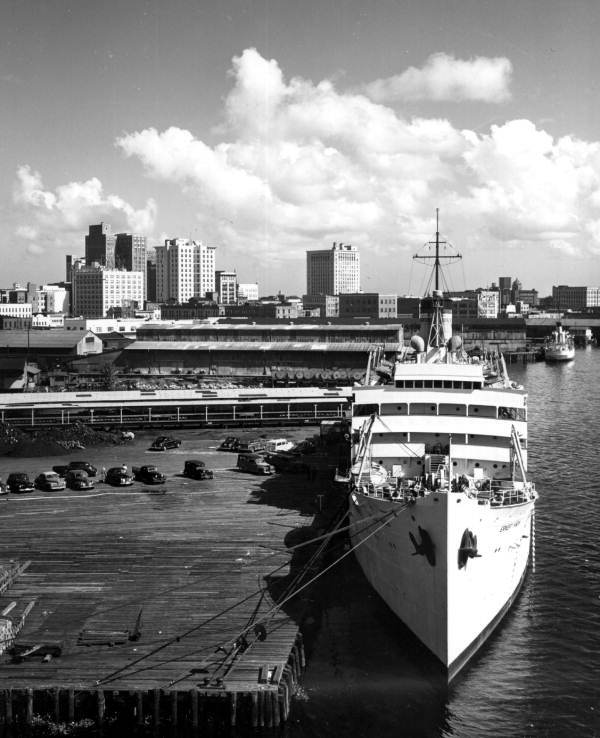 Hopefully the riverwalk extension will improve that neighborhood's chances for a revival. Speaking of that, does anyone know when the Acosta Riverwalk portion will be open to the public? Right now, it dead-ends at CSX. ^Sometime before the super bowl arrives. They're currently building a pedestrian bridge over the railroad tracks next to the Acosta. Has anyone ever suggested the tracks be diverted from downtown? i mean the tracks and the huge steel draw bridge thing isnt the most attractive thing in the world. it would cost money but it would be nice. plus the noise from trains isnt too attractive either. I kind of like the old steel truss bridge. Its the last old relic along the riverfront thats left over from the area's industrial past. Leaving the rail tracks there also leave the option of the city having a future commuter rail system that uses the Prime Osborn as a transportation system. I guess I'm a sucker for the city's old steel truss bridges. They remind me of bridges in several older northern cities like Pittsburgh and Cleveland. The large number of them in Jax are definately something that makes this city's environment stand out from other southern cities. I love being at the Landing or down on the Northbank Riverwalk with my two sons (6 and 2) when a train goes by. They're amazed with everything about it from the descent of the bridge to the unique sound the trains make as they cross. It is also especially illustrative of CSX's presence here. Then again, not every kid is a trainhead. Now, if the King St. parking garage on the Southbank had been built on the other side of the tracks (south)...but that's another thread. I like the old bridges downtown. It adds alot of color. You have the green Hart, the brown railroad and the red Matthews, which will be an unfortunate loss. I'm sure that the new Matthews will be concrete, just like the Fuller Warren. Actually, I think that the new MAthews will have to be something more than concrete, like the Fuller Warren. If you notice, the Fuller Warren doesn't have that much clearance (it has a lot, but not like the Dames Point, Mathews or Hart). To build this, you need some sort of technology to hold it up, like cables or metal trusses, particularly because of the width of the channel, as it is much wider than the Fuller Warren. ^Cool, that would look awesome! It is a unique aspect that makes Jacksonville different with a neat looking drawbridge for trains. Also, wouldn't that upset CSX. I would like to keep them is Jacksonville and moving their tracks would probably make them angry. I am abig fan of that too! I love trains. maybe a new bridge that isnt as bad looking. im sure there is something that could be built giving jax an even more unique look.